While you’re considering that root canal treatment we proposed, I’d like to go over the benefits of this procedure and why your decision must come soon. First of all, your comfortable days may be numbered. The damaged nerve has a good chance of becoming infected. As abscess sets in, you’re facing the toothache of your life. Even worse–the tooth will be lost without treatment. Let’s assume you opt to go ahead before pain brings you in for emergency care. 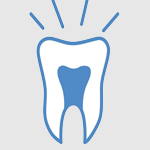 Through an opening in the tooth, we clean inside the root to remove the damaged nerve or pulp. This may take more than one appointment, depending on the curvature of the canal. When we’re satisfied it’s free of debris, we fill the tooth with a natural substance and seal the tooth back up. Your tooth is now “non-vital”-without nerves, but still nourished by surrounding tissues. Finally we cast impressions for a permanent restoration to protect the tooth. Some people think a root canal is an arduous alternative, physically and economically, to extraction. It’s not. During the procedure, you’ll be numb as you would for any other treatment. And as for your pocketbook, consider the cost of bridgework or a partial denture to replace the lost tooth.